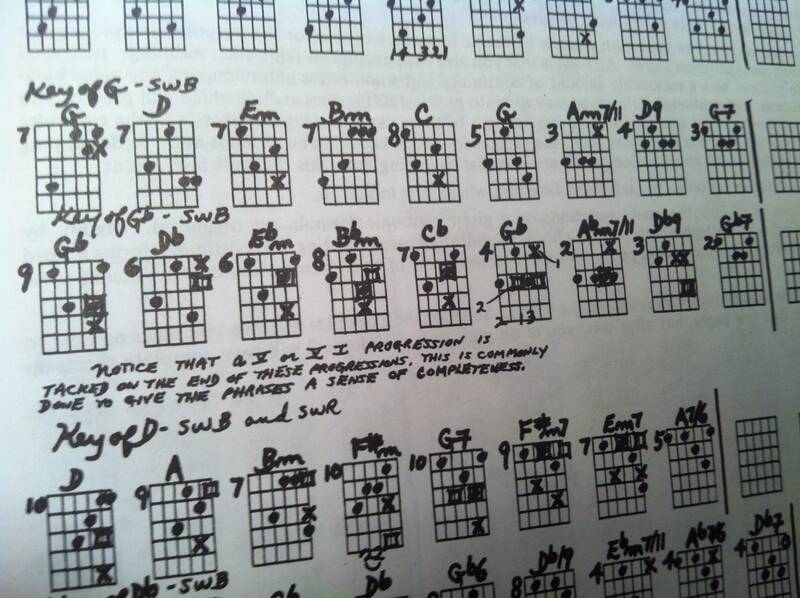 A notice by Ted in "Modern Chord Progressions" - ..:: The Ted Greene Forums ::.. Categories > Harmony & Theory > A notice by Ted in "Modern Chord Progressions"
I'm working my way through the Modern Chord Progressions book, and not to be nitpicky but I want to make sure I understand his handwriting and meaning of a specific notice completely. Indeed I see one progression ending on a V. Is he talking about "phrases" in a context of continuing to play/evolve after the V? Or is this written notice related to actually ending a song on a V chord? I don't think that A7/6 chord is an ending, you could end it by playing a D of some kind I suppose. The A7/6 makes it nice to repeat the phrase again too. Yes, you got Ted's handwriting right. Dave is correct stating that you can use that A7/6 to resolve to some kind of D major sound. I think Ted left a lot of the final resolutions up to you to choose.